The distraught family of an ethnic Shan woman who died after falling from a Rangoon police station window laid blame firmly with her interrogating officers during an emotional press conference on Wednesday. Grief-stricken Motohuko Namase told the meeting at Sakura Tower, downtown Rangoon, that his wife, Nang Wo Phan, died because she was terrified of the Bureau of Special Investigations officers and leapt from the fifth floor window due to her brutal interrogation. Nang Wo Phan died at 5 am on March 24 after plummeting five floors from the Police Bureau of Special Investigations building in Kyauktada Township in center of the former capital. Her husband had purchased land worth three billion kyat (US $3.9 million) under her name in Rangoon. A trusted employee then said that all the land actually belonged to him, and so Nang Wo Phan went to Hlaing Tharya Township police station to complain. However, officers did not follow up her complaints but instead arrested and interrogated her for three days straight about where she found the money to buy the land, claims her lawyer Ei Ei Aung. Motohuko Namase accused the police of being in league with the man who allegedly stole from them, adding that Nang Wo Phan, originally from Mong Pahlyo Township in Shan State, was the initial complainant and there was no rule of law due to police corruption. “She was too young to be interrogated in such an aggressive manner,” he said. “I heard the guy bribed the police with a car to arrest and investigate her instead. Ei Ei Aung told of the moment she watched her young client plummet to her death. “On March 21, the police Bureau of Special Investigations called me to say there was something that they wanted to discuss. After our meeting they eventually let me go home but kept Nang Wo Phan for interrogation. “While I was with Nang Wo Phan in the police office they left one guard to watch her everywhere that she went. She was kept in just the one room and only allowed a little sleep in between incessant rounds of interrogation. “She was afraid of the police as she didn't speak very good Burmese and didn't eat any food—when she drunk water she would vomit. The final time I saw her was on March 24 at 5 am when I she ran from the room and fell out of the window. Her father was also at the press conference. He said that he wanted a relative to complain about his daughter's death to Burma Vice-President Sai Mauk Kham, an ethnic Shan, but the police would not allow him to go home and return on a flight in the same day. 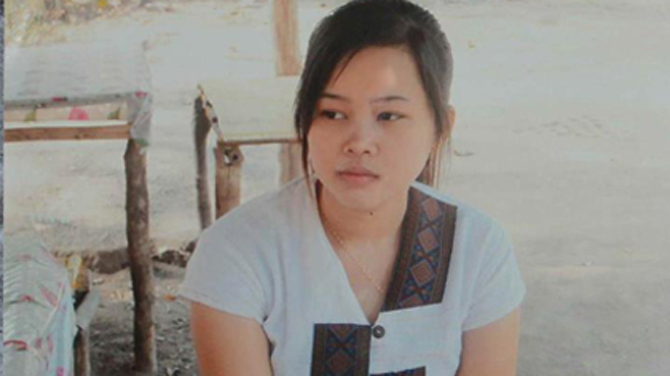 The police have claimed that Nang Wo Phan's death is an accident and deny the allegations made by her family. There were initial reports in the media that her body was cremated by the police, but it was in fact transferred from Rangoon Public Hospital to a local cemetery where it still remains. The family said that her funeral will be held on Saturday at 1 pm. Two journalists from Yangon Press International and The Voice Weekly were threatened by police officers from the Bureau of Special Investigation when they went to cover the incident, according to local reports. Police officers from the bureau appeared at the press conference and took photographs of everyone present. Bureau of Special Investigations officers have refused to disclose any information about the incident and even intimidated nearby office workers not to discuss what happened. Ye Tun, a Member of Parliament for the Shan Nationalities Democratic Party representing Thibaw Township in Shan State, said he was going to bring up the matter in Parliament in order to force a thorough investigation of the case.